As I’ve written on a number of previous occasions, a DUI can happen to anyone. There isn’t a person who plans for it to happen and often many are shocked when a police officer or a state trooper pulls them over for suspicion of drunk driving. If you are stopped for drunk driving, remain calm (watch my videos) and avoid making these three mistakes! Telling police anything about what you drank or where you were coming from that evening. The prosecution (District Attorney) needs the results from a blood or breath test (breathalyzer) to prosecute you for DUI. This is simply not true! In Pennsylvania under Section 3802(a)(1), Section 3802(d)(2) and Section 3802(d)(3)), the prosecution can and will proceed under the general impairment section of the DUI statute which doesn’t require the prosecution to introduce blood alcohol concentration (BAC). In these situations, the prosecution only has to prove that you were in control of the vehicle and impaired to such a degree (from drugs and or alcohol) that you were unable to operate it safely on the roads or streets in Pennsylvania. The prosecution can establish this through the observation of a police officer and even a civilian witness but obviously the observations of the officer are much stronger. Police are trained in these types of situations and have experience making arrests. While the prosecution can use your physical appearance, they can also use anything you tell police against you. This is known as a party admission. Always be respectful to police but don’t provide any information other than your driver’s license and insurance information. 2. Refusing the chemical test (blood or breath)! You DO NOT have a constitutional right to refuse a breath or blood test – the Fifth Amendment right to remain silent. In the case of a breathalyzer test, the recent US Supreme Court decision specifically says that police don’t need a search warrant. The Court found that a search warrant is necessary in the case of a blood test because it is much more of a severe government intrusion. Since that decision, Pennsylvania courts have found that a person’s consent doesn’t equate to a waiver of the search warrant requirement for blood so taking the blood tests would not change the inadmissibility of the evidence and your defense options. Unlike a chemical test (blood or breath) you do have a right to refuse to take a field sobriety test (walk and turn, HGN, one leg stand). It is important to consider, however, that if you refuse the test the prosecution will more than likely argue that your refusal is a “consciousness of guilt” and that you refused to take it because you knew you would fail. In these situations you have to consider why you are refusing the test. Normally I only advise people not to take the test if they are physically unable to do so but even in those situations, I think it’s a good idea provided that you explain to the officer that you have a physical condition which may affect your ability to correctly perform these movements. If, however, you don’t take the test your attorney can always argue why you chose not to take the test and make a very good argument. 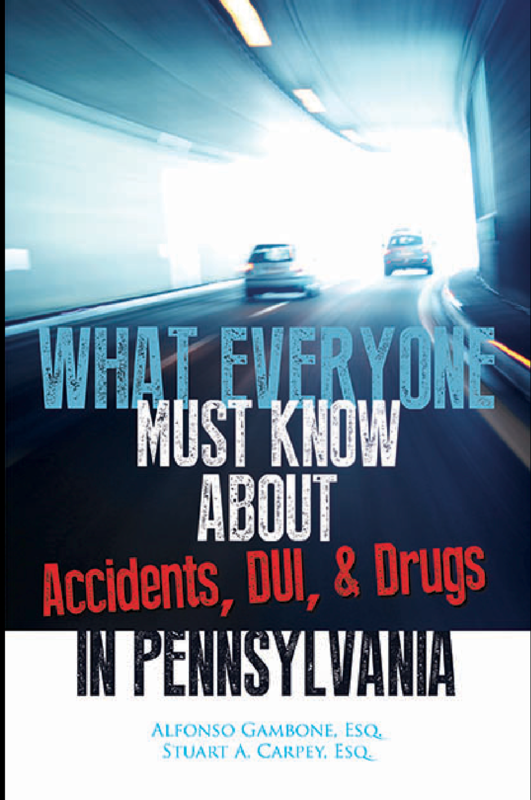 If you’re charged with a DUI in Pennsylvania I encourage you to visit my website and download my latest free book!